Flawless Legs® breakthrough design gives you 4-times more coverage than razors. Floating heads contour to every curve - even small, delicate areas around ankles and knees. Plus the built-in LED lights make it easy to see and remove it all with no nicks, cuts or irritation. We recommend replacing the head of your Flawless® Legs® unit every 3 to 6 months. You can get a complete replacement head – with the four individual floating heads with 18-karat plating! Does Flawless Legs® pull hair out by the root? Flawless Legs® is not an epilator - there is NO pulling hair out by the root (ouch!). The secret to Flawless Legs® instant and painless hair removal is the revolutionary Butterfly™ Technology that erases hair by microscopically paring it down through the spinning head. Neatly and discretely housed under the 18 karat gold-plated head, the Butterfly™ Technology ensures precision hair removal without nicks, cuts, or irritation. Flawless Legs® does not use a laser or hot wire; it's safe on all skin types and tones. The revolutionary Butterfly™ Technology erases hair instantly and painlessly by microscopically paring it down to the surface of the skin. 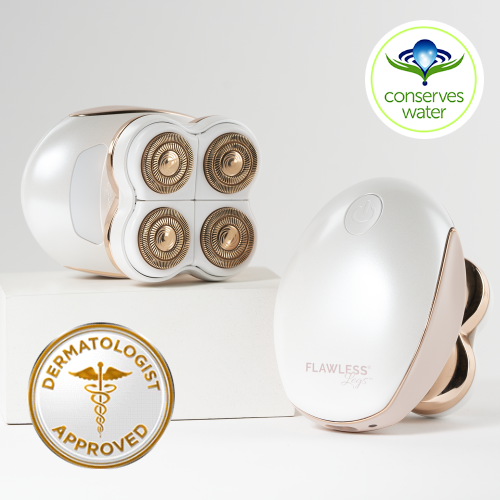 How long does Flawless Legs® hold a charge? How do I clean my Flawless Legs® unit? NOTE: Do NOT use Flawless Legs® in the shower or submerge it in water to clean. While the unit is water resistant, it is NOT water-proof. To clean your Flawless Legs® unit, hold the main body of the shaver in one hand, and with the other hand, grip the tabs on the lower head and pull it away from the upper head. To remove hair clippings from the lower head, simply turn it over and gently shake it out over a trash can. Use the unit's cleaning brush to dislodge and remove any clippings stuck in the heads. How often should I replace my Flawless Legs® head?